You can furnish a garden with all the flowers and foliage that you want as Sutton Seeds provides seeds, seedlings, and a variety of plants. This also holds tools and other gardening equipment for you to use to make sure that your plants get the proper care they deserve. Plug plants from Suttons are a very cost effective way of buying plants as you get lots of plants for your money. Choose from extra value plug plants or value plug plants, which will need growing on before they can be planted out in your garden borders or containers or garden ready plug plants, super plug plants or pot ready perennial plug plants that can be placed in pots or borders immediately. You'll find plenty of advice on the website on how to look after your plug plants and, with the correct care, you will soon have a garden full of colourful blooms. Can PayPal be used to pay? Yes orders can be paid for using PayPal. If you wish to pay for your order using this method please select PayPal at checkout. If you want more information on any products or services please contact the Customer Services team on 0333 043 0700. Can I have items delivered to different addresses? No, Unfortunately this option is not available. If you would like things delivering to different addresses then you will need to make two separate orders. 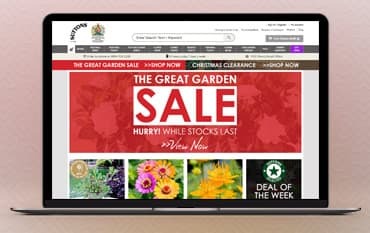 Suttons sell top quality vegetable seeds, bulbs, flower seeds, plug plants, gardening equipment and fruit and have been an inspiration to gardens since 1806. All products have the Suttons guarantee of quality, and you can be reassured that your order will be dealt with promptly, professionally and carefully. Throughout the site you will find plently of money saving offers, such as bulk buy discounts and promotions on certain products. Using a Suttons Seeds offer code is also a fantastic way to save on your online order, all the valid and current code will be listed below and will provide an instant saving on your basket total.